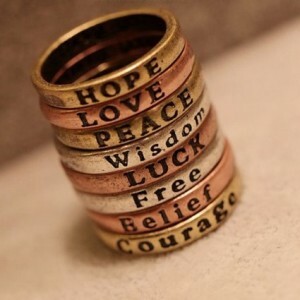 Set of 8 Inspirational Rings Just $3.49 Shipped! You are here: Home / Great Deals / Amazon Deals / Set of 8 Inspirational Rings Just $3.49 Shipped! Looking for a little inspiration? Head over to Amazon and get this set of 8 Inspirational Rings in Copper, Silver and Gold for just $3.49 shipped! Words include: Love, Free, Hope, Courage, Belief, Luck, Wisdom, and Peace.